Before making New Year’s resolutions, plan ahead. Start by reminding yourself that the stats are bleak. Some surveys indicate that only 8% of people who set New Year’s resolutions stick to them. A “super” skim milk tastes like 2%, but still has 0A% fat. Photo courtesy Farmland Dairy. Case in point: We’d resolved to lose weight every year for decades. Like most inveterate dieters, sometimes we did, sometimes we didn’t; but it always found its way back. Twelve years ago, we switched our strategy to healthier eating. Each year, we resolved to make one better-for-you switch. And it’s easy! Our switches to date follow, with the disclaimer: We’d never hold ourself up as a paragon of good eating. Our job is to taste lots of food, including the sugar laden and the fat laden. But we do feel good that we’ve made one of these swaps every year, and have never once felt deprived. Whole wheat instead of refined white flour is another easy switch. 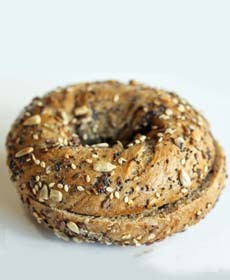 We love a Whole Wheat Everything bagel. Photo courtesy Brooklyn Bagel & Coffee Company. Bloody Marys, Martinis or on the rocks drinks for sweet cocktails. After we realized the sugar levels in most cocktails, we’d rather have ice cream and drink alcohol with no sugar added. Brown rice for white rice. We’re big sushi eaters, and try to patronize restaurants that offer the brown rice option. Cheese for cheese less often. We had a daily craving for fine cheese, and we could eat half a pound at a sitting, eight times the recommended portion, eight times the calories and cholesterol. We had no interest in reduced-fat cheeses. Instead, we opted for a “eat all the cheese you want” day once a month. Club soda for diet soda. After reading scientific studies on the impact of artificial sweeteners on the endocrine system, we bought a SodaStream and drink lots of club soda with wedges of citrus. Fish and tofu for red meat. We made this choice not because of cholesterol, but to do our small part to save the environment from the ravages of raising meat. Fresh fruit every day. It really helps cut down on the yen for cookies and other processed sugar. In the winter months, there are plenty of apples, bananas, grapefruit, oranges and strawberries. In the summer months, we revel in the explosion of choices. Nonfat Greek yogurt for sour cream. We had a bad sour cream habit—we could eat it from the container with a big spoon. Now, we eat plain Greek yogurt and use it instead of sour cream—with cottage cheese and other foods. It’s so thick that we even use it as a bread spread, instead of cream cheese. Oatmeal and other whole grain cereals. So long, Corn Flakes and Snap, Crackle and Pop. Our breakfast cereals now focus on whole grain oatmeal and Cheerios. (We discovered that, while corn is a whole grain, the manufacturing process used to make Corn Flakes over-processes the corn to the point where little fiber is left.) A trick for enjoying our favorite oatmeal, steel cut oats, daily: Instead of spending 30 minutes stirring every day, cook a large batch on Sunday and reheat a portion each morning. Olive oil instead of butter. From sautéeing to bread dipper, heart-healthy olive oil is our go-to fat. We did compromise on baking, however. We love the buttery taste of olive oil in brownies, cookies and cakes. On the other hand, an Italian-style olive oil cake works. Salad every day, no matter what. We love a big salad, but some days our food journey doesn’t lead us to one. We now have a Plan B: Snacks of crudités (raw vegetables). It’s easy to carry baby carrots around, and we pay extra for ready-to-eat broccoli and cauliflower florets so we have no excuse. 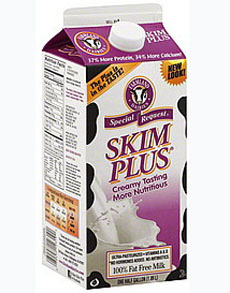 “Super skim milk” for regular skim, 1%, 2% or whole milk. We can drink two glasses of milk a day. We got rid of the whole milk and the half and half for “super” skim milk, a premium variety that removes more of the water so that the 0% fat milk actually resembles 2% (and has more protein as a result). Our local Farmland Dairy makes Skim Plus brand, which became so popular that it is now also made in variations with added Omega 3 or added fiber. Whole wheat for white flour. Whether in bread, bagels or pasta, this was a surprisingly easy switch. We only miss the taste of white flour in pizza crusts, and pizza isn’t something we eat often.